Wijedasa Rajapakshe says he has no intention whatsoever of resigning from his Justice and Buddha Sasana minister portfolio. Rajapakshe specially criticized health minister Rajitha Senaratne, accusing him of exacting revenge instead of addressing public health issues such as the dengue and kidney epidemics. At the last cabinet meeting as well as thereafter, the justice minister came under strong criticism from his colleague. Rajapakshe said it was Senaratne who was trying to control the attorney general’s department and the judiciary, so that he had no time to do his duties at the health ministry. Those who speak about the injustices done to the Sinhalese and the Buddhism, as well about the need to protect national assets such as Trincomalee and Hambantota is highlighted, are criticized and branded as racists and tribals, he charged. When the justice minister says the war heroes who ended the brutal terrorism will not be allowed to be hauled before to international war tribunals and to the gallows, he becomes a tribal, he said. When the justice minister says the judiciary should be independent and there should be no political interferences, he becomes a tribal. Rajapakshe went onto say that the country would be ruined when cowards who cannot come out of their mentality of slavery become its rulers. He, commended president Maithripala Sirisena, but made no mention of prime minister Ranil Wickremesinghe. The justice minister said that even the president would have approved of the remarks he has made about the civil society, including human rights lawyer Lakshan Dias. Neither the president nor the premier is yet to make any public remark with regard to the accusations against Rajapakshe. 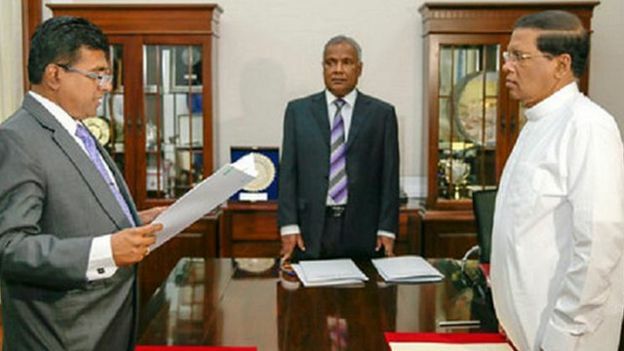 The PM has recommended Rajapakshe to be the justice minister and also appointed him as his representative at the constitutional council.